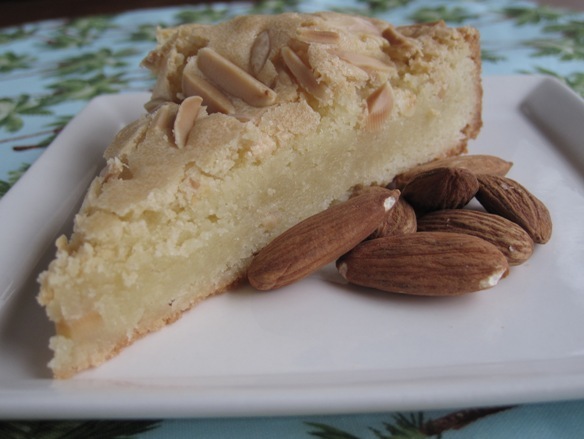 Almond cake doesn’t sound fancy. It’s not really. It’s easy to make with things you may already have on hand in your pantry. Birthdays were always a big deal when I was growing up. Not in a crazy birthday party, gift bag, bazillion dollar way like I see people do for their kids these days. In a simpler way that made me feel special and doted on. Usually mom woke me up and there were some birthday presents to open first thing in the morning before school. In grade school there was always a special homemade treat to take in and share with the class. My favorite was the cupcakes made in ice cream cones. Later, dad would bring me flowers and maybe a balloon when he got home from work. My dad was the first man to ever bring me flowers. As it should be, I suppose. (He still brings them to me regularly!) That always made my night. Then we were off to dinner at the restaurant of my choice which was usually Asian of some sort. As a teen I got to bring one friend of my choice to dinner, too. When dinner was over we headed home to meet my grandparents and aunt and uncle, etc, and have the homemade birthday dessert I had chosen and open a few more birthday gifts. I was never much of a plain cake girl so I usually requested something else. A lot of times it was this chocolate mousse that my aunt makes. A full day of being made to feel special. Birthdays are supposed to be like this in my mind. And my family and husband do a tremendous job of still making me feel special. I, of course, try to return the favor. In a 350 degree oven toast the slivered almonds. Should take about 8 to 10 minutes. 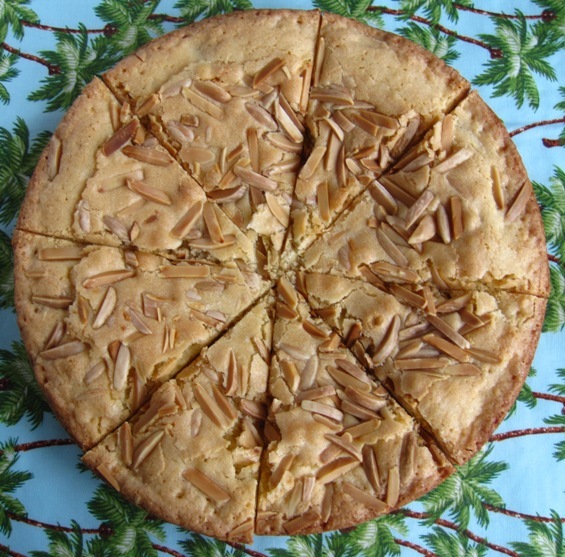 Allow the almonds to cool. Mix sugar and melted butter together. Add eggs, almond extract, vanilla extract, salt. Mix well. Add flour. 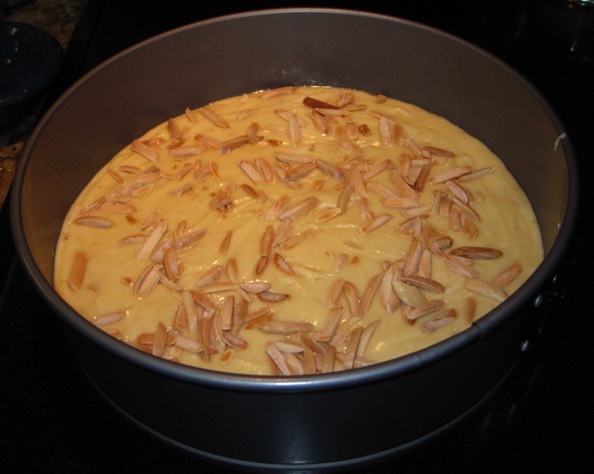 Stir in 1/4 cup of the slivered almonds. Spray an 8″ spring form pan with non stick spray. Pour batter in pan. 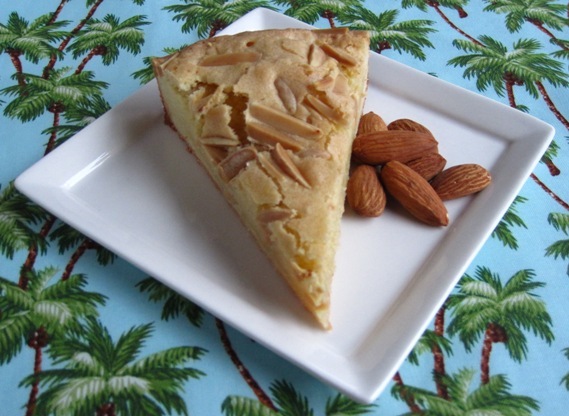 Sprinkle with remaining 1/4 cup almonds. Bake at 350 degrees for about 35 minutes. Posted in Sweet and tagged almond, birthday, Cake. Bookmark the permalink. Omg. That looks delicious. Is it the consistency kind of like the russian tea cakes? Not as dry as the tea cakes. This cake is moist and rich and dense. It’s so good. Everyone loved it. It was delish! And even being so dense, managed to kind of melt in the mouth. Sarah, I’m loving this site!! Dan’s an almond lover. I’ll have to try this out on him. I did make your pie roll ups. I don’t know if any of those made it until he got home from work. The kids LOVED them! I’m so glad you liked the roll up pies! They were certainly always a huge hit when I was a kid! 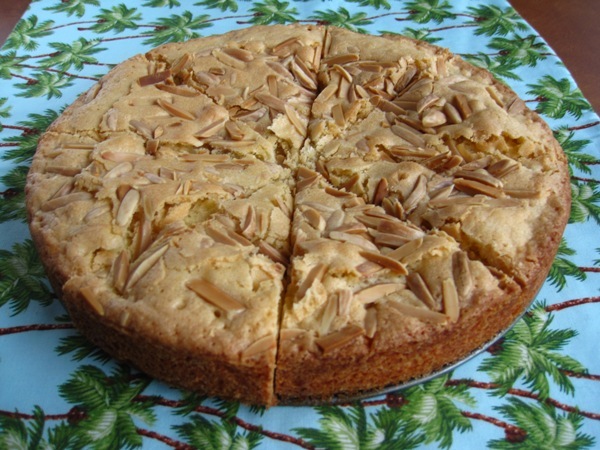 I hope you like the almond cake, too. Thanks for the site feedback! I’m having fun with it!